Critically-acclaimed writer Jonathan Hickman (THE BLACK MONDAY MURDERS) and artist Nick Dragotta’s EAST OF WEST, THE APOCALYPSE: YEAR TWO deluxe oversized, prestige format hardcover edition will collect the Second Year of the Apocalypse storyline—issues 16-29 of the ongoing series—and hit stores this March. EAST OF WEST took the comics industry by storm and defined the sci-fi/western genre crossover long before HBO’s Westworld and other similar stories tooks off. 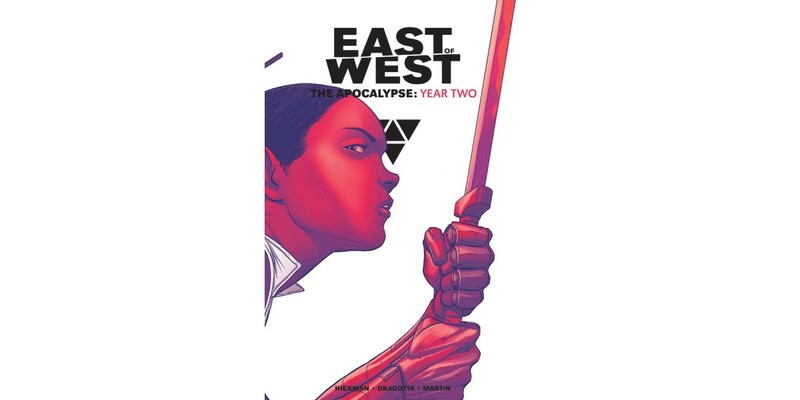 EAST OF WEST remains a fixture on the New York Times bestseller list and one of the most successful creator-owned series on the market.